I can recall all of the times I’ve had cornflakes in my dessert: once, last week at Hen of the Wood in Burlington. 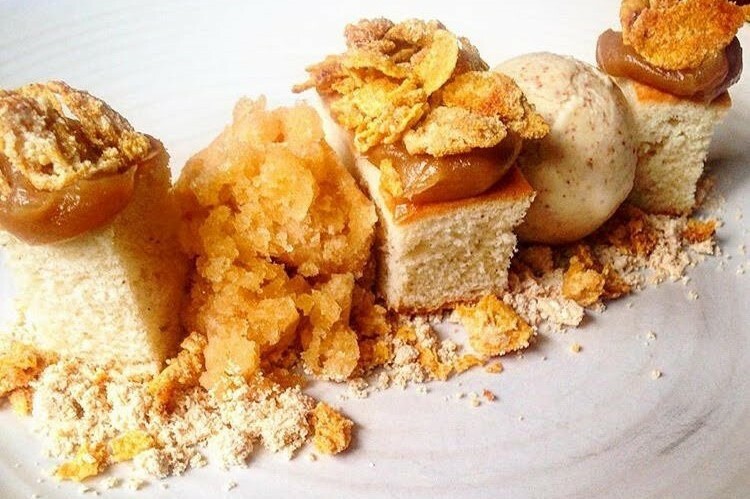 The dessert was a brown-butter cake with peanut butter ice cream and apple granita, all topped with slightly crumbled cornflakes. It hit just about every taste and texture possible. The cake was light, the peanut butter ice cream salty and a bit rich; the apple added a bit of pucker, and the cornflakes gave it crunch. The dish was equal parts delightful, complicated and playful. We ordered two of them. The maker of this dessert was Laura Schantz, 28. This fall, she’ll mark her third anniversary with Hen of the Wood. The Jericho native started as garde manger (salads and other cold dishes) and worked her way up to sauté. 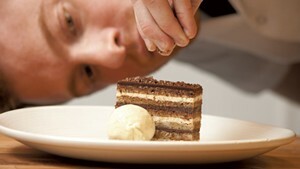 When pastry chef Andrew LeStourgeon left HOTW last August, Schantz stepped into his shoes. Post-dessert, I sat down with Schantz at HOTW's sister restaurant, Juniper, at Hotel Vermont. Over coffee, we chatted about her job. SEVEN DAYS: How did you come to Hen of the Wood? 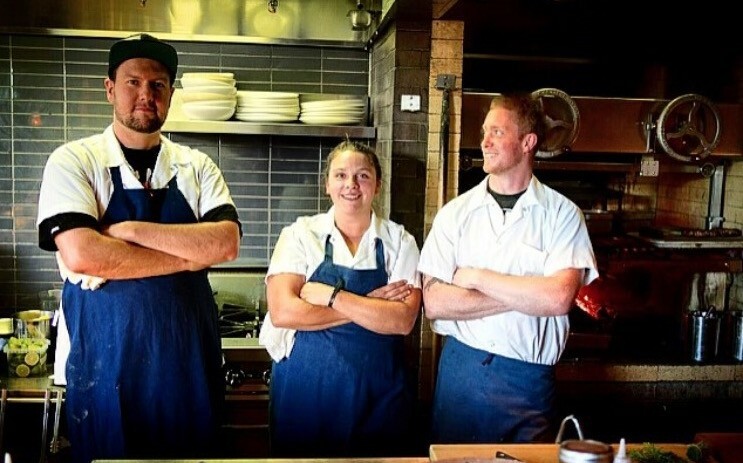 LAURA SCHANTZ: One of my really good friends, Dan [Phillips], worked with me [at the Belted Cow Bistro in Essex Junction] and heard that Hen of the Wood was opening in Burlington, and was super stoked. I’d never even heard of it, to be honest with you. So I emailed the chef here [Juniper] asking for a job and he was like, “Well, this isn’t Hen of the Wood.” Then I emailed the owner of HOTW asking for a job at Juniper. I was so confused. When Dan got hired, he told the chef de cuisine that he should really look into me. The chef de cuisine, Jordan [Ware], came to me and said, “Dan says you’re highly recommended." I worked garde manger and then I worked my way up to oven, and then I worked my way up to sauté. Then, when our last pastry chef was leaving, I thought it would be a great fit for me to jump on to pastry. SD: How much of your day do you spend baking? LS: I’m understaffed right now. I’m looking for employees. But generally I’m there five to six days a week, sometimes seven, but usually just dropping in to make sure everything is moving smoothly. I’m never not in the kitchen. The only time I’m not doing what I want to be doing is when I’m invoicing. I do the desserts here for Bleu [Northeast Seafood] and [HOTW] and Doc Ponds. SD: Do the restaurants have similar menus? LS: Juniper and Bleu have the same menu. I make a majority of their desserts. They do have a coconut cake that they order in. All their ice creams and sorbets come from me, and Waterbury [HOTW] has the same menu as we have in Burlington; I do all their desserts. For Doc Ponds, I do all the ice cream production for their milkshakes, and we do their pie program. SD: What are three foods that make life worth living for you? LS: Lemon cake, definitely — lemon anything, really. I just like lemon. Grapefruits. I think I’m a citrus person. You could probably just broaden that to citrus. What else do I totally love? Indian food. Curry, spices, anything with a punch of flavor. SD: What was your inspiration for the brown-butter cake? LS: Our old pastry chef made this butter cake. They were amazing, don’t get me wrong. He plunged the cake in melted butter and let it sit so it would soak it all up, and then he would roll it in cinnamon and sugar. When I started making the butter cake, I didn't want to go that route, because it was so donut-y and intense. So I decided to go with brown butter to give it that full nuttiness. Then I was thinking brown butter/peanut butter — those flavors go together. You need something really tart to go through that. So that’s where the granita came in. And then, as I was eating it, I thought, It’s missing something. I had accidentally [received] cornflakes and decided that if I put this salty-powdery loveliness on them and baked them they would be awesome. That’s how it happened. SD: What's the story behind your "Little Sweets"? LS: Andrew, our pastry chef, is a very tall, ginger man. The joke was that he was called "Little Sweets" because he was ginormous and he made dainty little sweets. When I took the job, the first two or three weeks I stuck with his menu just to get acclimated and understand the flow, and from there I was just like wildfire. I just did my own interpretation of it. Now, everything on the menu is mine. SD: What’s your secret to getting people to come in and order dessert? LS: I think Hen of the Wood just gets people in. And then, as full as people are [after dinner], I think when they hear about the dessert program and that we’re doing all of our own things in-house, they get excited. I have a couple of loyal fans that come in every time I change something. Having worked the line, I get people who have sat in front of me and chatted with me. They still come in and see if I’m there and what I’m up to, and if I can come say hi. It’s really great. I actually had this one guy bring me an aloe plant once. I had so many burns from working the wood-fired oven. While they were eating dinner, we talked and I sent them a few treats. Then, the next day I was in the weeds, cooking like it was going out of style, and, out of the corner of my eye, I saw this guy with a bag and I’m like, “What the hell?” I go over because I recognize him… He says, “Hey, I brought you a present,” and puts it down and says, “Use it.” Then I open it and it’s an aloe plant. I still have it. It’s three times bigger. I repotted it this spring. SD: What do you love about your job? LS: I love the long hours, I love the stress, I love making people happy. SD: Is there anything else you want people to know? LS: They should have dessert first because it’s delicious. I always love it when people come in and are like, “I get dessert first.” I think, Yes, I love you.